I wrote a guest post about OpenSesame on the NeuroDebian 'insider blog' (link), and I thought this would be a good time to share how development of OpenSesame 0.25 "Dashy Darwin" is coming along. And "Dashy Darwin" is coming along nicely! A lot of bugs have already been fixed. There's not much new functionality, but quite a bit of polish has been added to the interface. 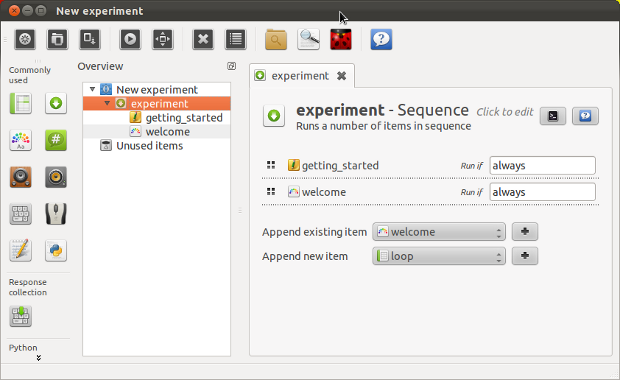 For example, the controls of the sequence item have been revamped (see the screenshot above). You can now re-order and add new items to a sequence by dragging and dropping, which is a definite improvement over the use of buttons. For those who are keen to try out the new version, experimental packages (0.25-pre1, Windows, Linux and Source — no Mac OS yet, sorry!) can be downloaded here. But the usual warnings apply: This is a potentially highly unstable, experimental snapshot!